مقدادی اصفهانی, امیر همایون. (1395). بهبود عملکرد روش شبکه‌ی بولتزمن به منظور مطالعه عددی جریان گاز در محیط‌های متخلخل نانو مقیاس. نشریه پژوهشی مهندسی مکانیک ایران, 18(2), 87-105. امیر همایون مقدادی اصفهانی. "بهبود عملکرد روش شبکه‌ی بولتزمن به منظور مطالعه عددی جریان گاز در محیط‌های متخلخل نانو مقیاس". نشریه پژوهشی مهندسی مکانیک ایران, 18, 2, 1395, 87-105. مقدادی اصفهانی, امیر همایون. (1395). 'بهبود عملکرد روش شبکه‌ی بولتزمن به منظور مطالعه عددی جریان گاز در محیط‌های متخلخل نانو مقیاس', نشریه پژوهشی مهندسی مکانیک ایران, 18(2), pp. 87-105. مقدادی اصفهانی, امیر همایون. بهبود عملکرد روش شبکه‌ی بولتزمن به منظور مطالعه عددی جریان گاز در محیط‌های متخلخل نانو مقیاس. نشریه پژوهشی مهندسی مکانیک ایران, 1395; 18(2): 87-105. روش شبکه بولتزمن متداول (استاندارد) صرفاً قادر است نتایج جریان در مقیاس میکرو را -که معمولاً منطبق بر رژیم جریان لغزشی است- بخوبی پیش‌بینی نماید اما برای جریان در مقیاس نانو –که معمولاً منطبق بر رژیم گذرا است- از دقت کافی برخوردار نیست. در این مقاله با انجام اصلاحاتی در روش شبکه بولتزمن، جریان در نانو کانال حاوی محیط متخلخل در بازه وسیعی از رژیم‌های جریان، شامل رژیم لغزشی و گذرا، به کمک روش مذکور مدلسازی شده است. همچنین برای اولین مرتبه پدیده مینیمم نادسن در میکرو و نانو‌کانال‌های حاوی محیط متخلخل مشاهده شده و مورد ارزیابی قرار گرفته است. Karniadakis, G., Beskok, A., and Aluru, N., “Microflows and Nanoflows Fundamentals and Simulation”, Springer Inc., USA, (2005). 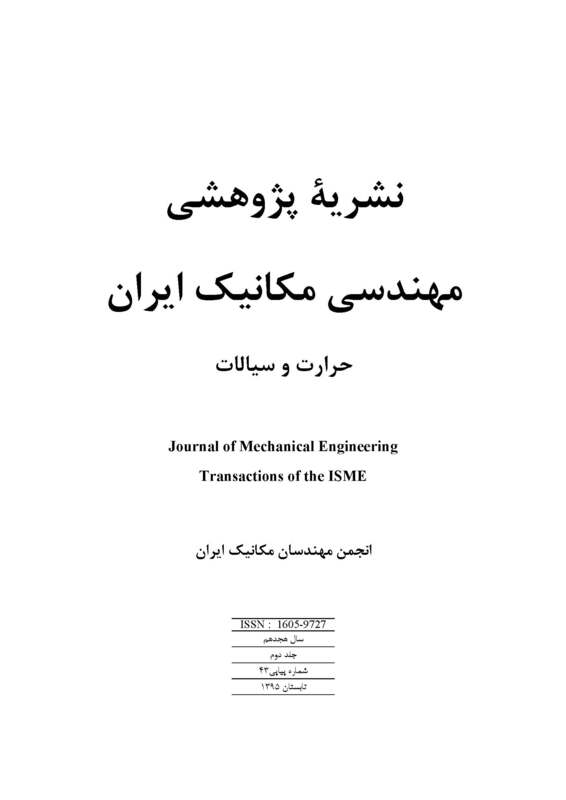 Nazari, M., Kayhani, M. H., and Anaraki Haji Bagheri, A., “Comparison of Heat Transfer in a Cavity between Vertical and Horizontal Porous Layers using LBM”, Modares Mechanical Engineering, Vol. 13, No. 8, pp. 93-107, (2013). Liu, X., and Guo, Z., “Lattice Boltzmann Study of Gas Flows in a Long Micro-channel”, Computers & Mathematics with Applications, Vol. 65, No. 2, pp. 186–193, (2013). Zhang, J., “Lattice Boltzmann Method for Microfluidics: Models and Applications”, Microfluidics and Nanofluidics, Vol. 10, pp. 1-28, (2011). Guo, Z., Shi, B., and Zheng, C., “Velocity Inversion of Micro Cylindrical Couette Flow: A Lattice Boltzmann Study”, Computers & Mathematics with Applications, Vol. 61, No. 12, pp. 3519–3527, (2011). Meng, J., and Zhang, Y., “Accuracy Analysis of High-order Lattice Boltzmann Models for Rarefied Gas Flows”, J. Computational Physics, Vol. 230, No. 3, pp. 835–849, (2011). Shan, X., Yuan, X. F., and Chen, H., “Kinetic Theory Representation of Hydrodynamics: a Way Beyond Navier-Stokes Equation”, J. Fluid Mechanics, Vol. 550, pp. 413-441, (2006). Chikatamarla, S. S., and Karlin, I. V., “Entropy and Galilean Invariance of Lattice Boltzmann Theories”, Physical Review Letters, Vol. 97, No. 19, (2006). Ansumali, S., Karlin, I. V., Arcidiacono, S., Abbas, A., and Prasianakis, N. I., “Hydrodynamics Beyond Navier-Stokes: Exact Solution to the Lattice Boltzmann Hierarchy”, Physical Review Letters, Vol. 98, 124502, (2007). Zhang, Y. H., Gu, X. J., Barber, R. W., and Emerson, D. R., “Capturing Knudsen Layer Phenomena using a Lattice Boltzmann Model”, Physical Review E, Vol. 74, 046704, (2006). Tang, G. H., Zhang, Y. H., and Emerson, D. R., “Lattice Boltzmann Models for Nonequilibrium Gas Flows”, Physical Review E, Vol. 77, 046701, (2008). Tang, G. H., Zhang, Y. H., Gu, X. J., and Emerson, D. R., “Lattice Boltzmann Modeling Knudsen Layer Effect in Non-Equilibrium Flows”, EPL, Vol. 83, 40008, (2008). Homayoon, A., Meghdadi Isfahani, A. H., Shirani, E., and Ashrafizadeh, M., “A Novel Modified Lattice Boltzmann Method for Simulation of Gas Flows in Wide Range of Knudsen Numbers”, International Communications in Heat and Mass Transfer, Vol. 38, pp. 827–832, (2011). He, X. Y., Chen, S. Y., and Doolen, G. D., “A Novel Thermal Model for the Lattice Boltzmann Method in Incompressible Limit”, J. Computational Physics, Vol. 146, pp. 282-300, (1998). Succi, S., “Mesoscopic Modeling of Slip Motion at Fluid-solid Interfaces with Heterogeneous Catalysis”, Physical Review Letters, Vol. 89, 064502, (2002). Polard, W. G., and Present, R. D., “On Gaseous Self-diffusion in Long Capillary Tubes”, Physical Review, Vol. 73, No. 7, pp. 762-774, (1948). Lim, C. Y., Shu, C., Niu, X. D., and Chew Y. T., “Application of Lattice Boltzmann Method to Simulate Micro Channel Flows”, J. Physics of Fluids, Vol. 14, pp. 2299-2308, (2002). Cercignani, C., “The Boltzmann Equations and its Applications”, Springer-Verlag, New York, (1988). Ohwada, T., Sone, Y., and Aoki, K., “Numerical Analysis of the Poiseuille and Thermal Transpiration Flows between Two Parallel Plates on the Basis of the Boltzmann Equation for Hard Sphere Molecules”, J. Physics of Fluids A, Vol. 1, No. 12, pp. 2042-2049, (1989). Scheidegger, A. E., “The Physics of Flow Through Porous Media”, Third ed. University of Torento Press, (1972). Tang, G. H., Tao, W. Q., and He, Y. L., “Gas Slippage Effect on Microscale Porous Flow using the Lattice Boltzmann Method”, Physical Review E, Vol. 72, 056301, (2005). Klinkenberg, L. J., “The Permeability of Porous Media to Liquids and Gases”, American Petroleum Inst., Drilling and Productions Practices, New York, (1941). Ergun, S., “Fluid Flow Through Packed Columns”, Chemical Engineering Progress, Vol. 48, No. 89, pp. 89-94, (1952). Bear, J., “Dynamic of Fluids in Porous Media”, Elsevier Publishing Company, Amsterdam, (1972). Shokouhmand, H., Meghdadi Isfahani, A. H., and Shirani, E., “Friction and Heat Transfer Coefficient in Micro and Nano Channels Filled with Porous Media for Wide Range of Knudsen Number”, International Communications in Heat and Mass Transfer, Vol. 37, pp. 890–894, (2010).